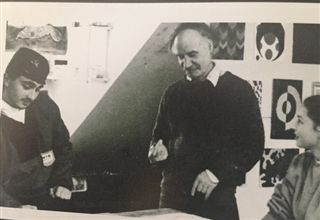 As a lifelong artist and beloved art teacher, Mr. Allen made a significant impact on generations of alumni at CH-CH. "Mr. Allen helped me find my way as an artist. His quietness and quirkiness made learning fun with no pressure. He also guided me on my course for success. His motto was “Art is Play” and I still go by this today in my own studio in Scottsdale, Arizona. Mr. Allen gave me confidence and put on the track for success. Thank you, Mr. Allen!" In honor of Mr. Allen, and to thank him for nurturing the creative spirit of so many CH-CH students, we are designing a special space in the re-imagined Barn. The Allen Art Space will be a flexible use alcove in the re-imagined barn that will support the work of both students and teachers. To make this space a reality, we must raise $50,000 by June 30, 2019. We are on the way to meeting this goal, but we need your help to reach it within this time frame! Please consider a gift of any amount to help us fund this new space on campus to honor Mr. Allen’s dedication to students and to the arts. All gifts can be made at https://buildingcreativity.chch.org/page/contribute-now. Give Now and Double the Impact! Your gift will make an even bigger impact because an anonymous donor along with the Allen Family has agreed to match each gift up to a total of $10,000! Questions about the Allen Art Space or Building Creativity: The Campaign for the Arts, please contact Ben Rogers at brogers@chch.org or 781-314-0810.